LINCOLN, Neb. — Spencer Lee and Austin DeSanto finished things off in dominant fashion Sunday, building on momentum created by Cash Wilcke in the Iowa wrestling team’s 20-13 win at Nebraska. 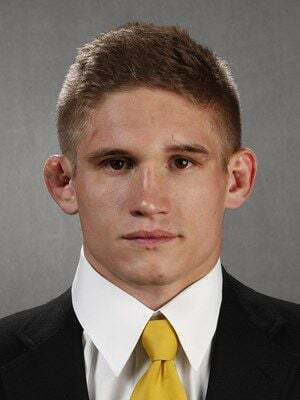 A win in the final seconds by Wilcke at 184 pounds over the Cornhuskers’ fourth-ranked Taylor Venz positioned the third-ranked Hawkeyes to avoid upset hopes by the ninth-rated Cornhuskers in front of a record crowd of 4,306 fans at the Devaney Center. In a meet which started at 141 pounds, the Hawkeyes trailed 10-6 through five matches when Wilcke, ranked 13th, took the mat to face the Nebraska sophomore. Among seven matches that were scoreless after one period, Wilcke appeared to be headed to overtime against Venz before scoring a takedown with 5 seconds remaining to open a 5-2 edge and erasing what could have been a riding time point for Venz. The victory was one of three for the Hawkeyes against opponents ranked in the top-11 nationally. Second-ranked Alex Marinelli remained undefeated at 165 pounds, using an escape, one penalty point and riding time to claim a 3-0 win over sixth-ranked Isaiah White, while Jacob Warner recorded a third-period escape to finish off a 4-1 decision over 11th-rated Eric Shultz at 197. Those victories allowed the Hawkeyes to overcome several disappointments. At 157, the Hawkeyes’ seventh-ranked Kaleb Young forced overtime against second-ranked Tyler Berger, who claimed a 3-1 victory with a takedown 19 seconds into the sudden-victory overtime period. Nebraska also picked up an upset at 285, where 14th-ranked David Jensen rode third-ranked Sam Stoll for the final two periods to claim a 3-0 decision. The loss was the first in seven matches this season for Stoll and it left Iowa trailing 13-12 heading into the final two matches. Lee and DeSanto left little doubt. In his 18-4 major decision at 125 over Nebraska’s 16th-ranked Zeke Moisey, Lee recorded one takedown, two reversals and collected 10 nearfall points. DeSanto followed with a 25-10 technical fall over Brian Peska at 133, piling up 12 takedowns in a match that ended after five minutes, 55 seconds. Returning the favor after Berger celebrated his win by blowing a kiss in the direction of the Iowa bench, DeSanto was penalized one team point for unsportsmanlike conduct following his victory. The win moves Iowa to 11-0 on the season, including a 6-0 start in the Big Ten.